Are you planning on buying or selling Leelanau County real estate in 2011? 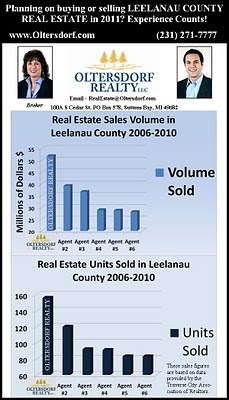 Nobody has sold more real estate in Leelanau County within the last 5 years! Oltersdorf Realty, LLC has sold over 51 million dollars of real estate volume in Leelanau County (representing buyers and sellers) and over 155 sales sides (homes, vacant, and commercial) within that time span! That’s over 32% more volume and 30% more than the next closest agent! Our detailed marketing strategy provides as much, if not more exposure than those “big name” real estate firms. Our listings are not only found on every major real estate website nationwide but we provide a much more in depth marketing packet for prospective purchasers than any other agent. Take a look at a sample marketing packet HERE! Call today to schedule an appointment! Now is the time to prepare your house to sell in 2011!